Hiring a car at Derry Airport can be a great option for visitors to the city. Our car rental Derry Airport deals offer great value for money. Check out our super cheap Londonderry Airport Car Rental deals. If it’s value for money you are after, then you can’t go wrong. We have provided low cost car hire in Ireland for many years. Select your pick-up and drop-off date plus hours and hit search. Avis and Hertz are car hire companies located at the airport. Derry Airport (LDY) is located 6 miles northeast of the city. Its situated on the south bank of Lough Foyle, a brief distance away is the village of Eglinton. The location of the city airport is beside a RSPB bird sanctuary which is something that continues to be a matter of concern following several reported bird strikes. There are plenty of good flights to book from various locations. Ulsterbus operate numerous scheduled services to and from the airport to the main Foyle Street depot in the City. Services also operate to and from Limavady. Ulsterbus and Translink services run all through Northern Ireland and from Belfast. Bus Eireann are the main bus providers in the Republic of Ireland to Derry, again terminating in the Foyle Street station. Many parts of County Donegal are served by the Lough Swilly Bus Company. A taxi rank is located in front of the airport terminal. Typically, a fare to Derry Town is around fifteen pounds. All of the nearby taxi firms in the City and the surrounding towns and villages will carry passengers to the airport. Belfast is about 70 miles from Londonderry and can be reached by road with your Derry Airport car hire in around 90 minutes. Also called Londonderry, Derry is located in Northern Ireland. It’s sometimes regarded as the fourth city of Ireland or the walled city. 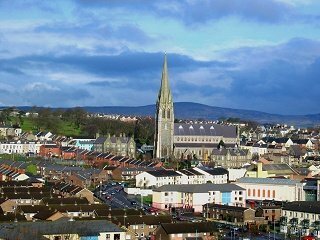 Derry is also known as the Maiden City. It is home to a long and rich history, a thriving arts culture, an exciting and varied nightlife and not one but two Nobel Prize winners. It would certainly be fair to say that Derry is a small place that packs a big punch! To say that Derry has something for everyone doesn’t start to do justice towards the sheer enormity of culture within it’s town walls. The artistic heritage of the city centre is nicely represented in several playhouses, museums and theaters. Art galleries are well represented, and the McKinney Academy of Irish Dance is certainly a must-see for just about any fan of this lively aspect of Irish lifestyle. The Academy takes bookings for performances as well as for a range of group functions. If Derry is your option of venue for a wedding, family reunion or some other group celebration, you may well wish to take advantage of this service. The town is also home to a variety of shops and retail venues. If you wish to bring home a distinctive souvenir or add a designer piece or two to your wardrobe then you should have no problems. If it is entertainment you’re after, Derry will not disappoint. Don’t forget to visit the famous Derry City Football Club. Situated on the River Foyle and with its close proximity to the countryside and some lovely beaches, Derry is a well-liked option for nature lovers as well. Cycling, water sports, fishing and hiking are all options for visitors to Derry. You can also compare Dublin Airport car hire costs plus we also provide car hire quotes for Cork, Shannon and Galway. If golf is your game, you will be pleased to find out that Derry is home to courses of international renown. Whatever your pleasure may be, rest assured that Derry will be able to provide!